The hyperlocation antenna is a 32 element antenna design that provides 360 degree coverage around supported access points - currently the 3600 and 3700 series APs. It is designed to integrate into the Cisco Aironet Hyperlocation Module with Advanced Security (RM3010L) providing precise RF Angle of Arrival (AoA) information, allowing the operating system a much more granular approach to the location of a client device. 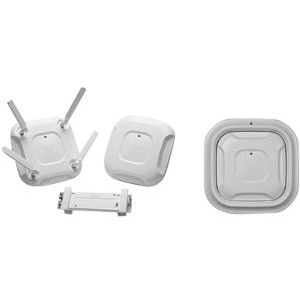 The hyperlocation antenna along with RM3010L helps in providing a location accuracy of less than a meter for a wireless clients, using WiFi and Bluetooth technology. The hyperlocation antenna operates in both the 2.4 GHz and 5 GHz frequency ranges and is designed for indoor use. External DART connector for location capability with the use of the Hyper-Location antenna.